The other day I mentioned that Will and I had started on a really fun project for the house: we created a Paint By Numbers wall mural! I've seen this kind of thing done before and always thought it was absolutely amazing, and now we finally got to do our own. It was actually a lot easier than I originally thought it would be. After find a painting that we really like, we picked out the colors in Photoshop then went down to Lowes and got color samples of all the colors we needed. The sample sizes were absolutely perfect for this project, and they only cost little over $2 each (score!). 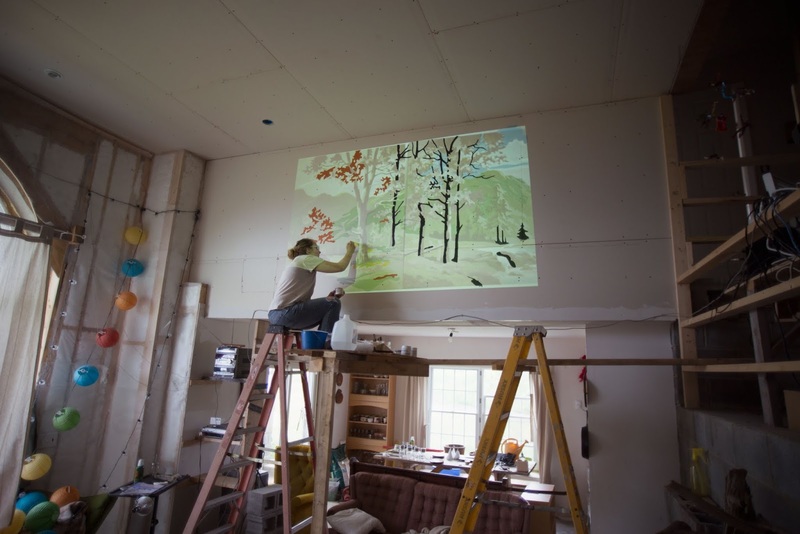 We then projected the painting onto our wall and traced it out. 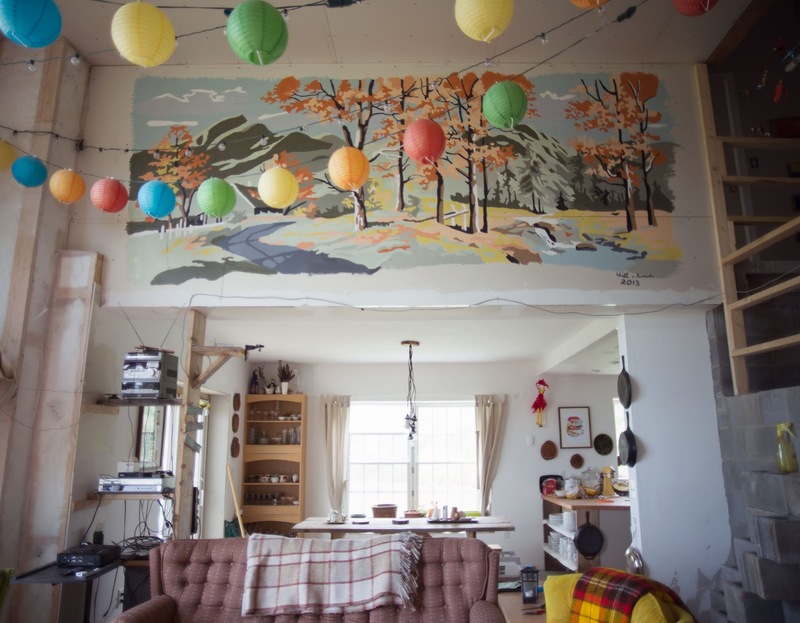 Wall Mural Time Lapse from Will Hyler on Vimeo. A time lapse of the process. I think the only thing about the whole project that I didn't care for was standing up on the scaffolding. I'm pretty ok with heights, but our scaffolding was just the slightest bit wobbly. Anytime Will or I moved I would get a moment of panic, haha. By the third day of painting I was doing much better, though. 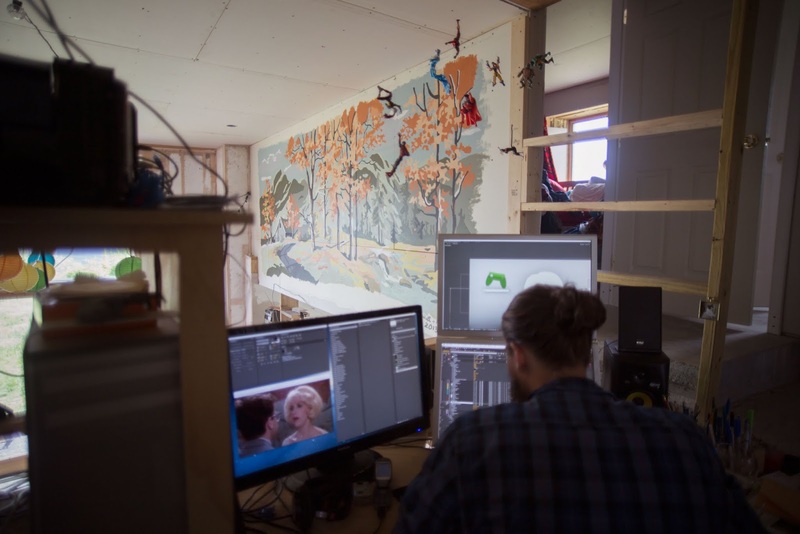 I think Will has one incredible view from his work area now with the mural on the right, the arch window looking out into the valley on his left, and of course his flying super hero figures form his childhood. I think we might build a nice little wood frame to go around the whole painting, just for a little extra something. This is incredible! Did you use a template or do it freehand? Oh, the talent!! It looks amazing! Maybe one day I'll get to do something like that in my future home. This is gorgeous! I'd never think of doing something like this, but it looks really cool. My goodness it turned out so lovely. You guys did a great job. I'm loving the colours! quite possibly the coolest thing every! love it! so beautiful! i bet it's such an inspiration to see every day! that is such an awesome project!! what an amazing piece of one of a kind art for you home! Wow, this is so awesome! Projectors come in so so handy. I really want one for stuff like this! Haha, and do I spy Little Shop of Horrors on the laptop screen?! That looks like a really difficult project, but it turned out amazing!! This is so beautiful! I've been oggling your instagram progress. You guys are just so creative. Wow! That looks so beautiful, and the video was so cool. Thanks for sharing the process! 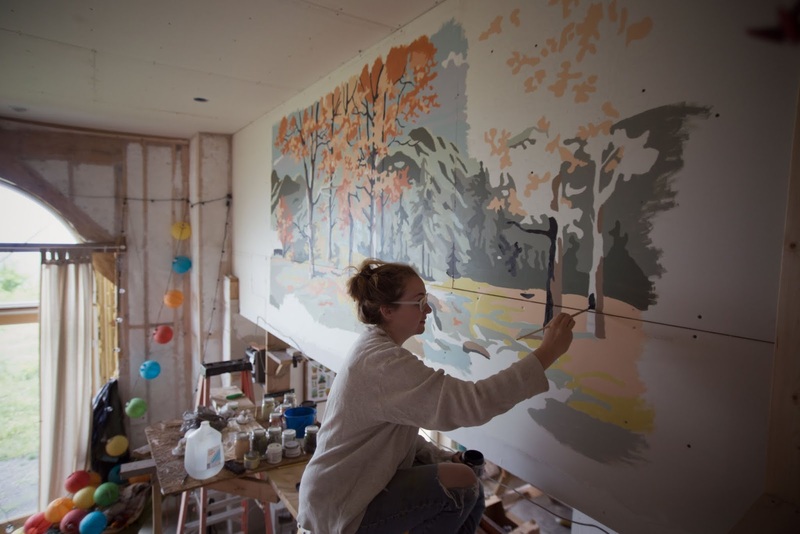 I'd love to do something like this if we ever get our own place someday. Wow, this turned out amazing! Oh I love that! What an awesome idea for that space. I love this! What a cool idea! It's beautiful. Oh really beautiful mural sweetie! Wow, this is such a cool and unique idea. It looks like it turned out wonderfully! That is so cool! I've always loved the way paint by numbers look. That is awesome! I am so glad you guys did the video because it really brings the whole project to life! What a great memory to have, too! That is one of the coolest things I've seen in a long time! But holy crap - that scaffolding! You're braver than I, lady. that is such a great idea! I hope to one day get a place of my own and go monkey nuts with it! love it! and that view from Will's desk? score! Oh my gosh I am in love with this idea!!! Can't wait to get a house so I have somewhere to try it! this is easily one of the coolest home projects i've ever seen! oh my word! This is incredibly awesome. Good call! That's one of the coolest house projects I've seen in a long time! You should submit it to Apartment Therapy, seriously. That is SOOO neat!! So creative. And I love the rainbow paper lanterns! Two things. 1.) This is AMAZING. 2.) I love that he's watching Little Shop of Horrors.